Dr. Nicholas Cassisi is a native of Cleveland, OH. Following the completion of an undergraduate degree at Western Reserve University (1954-1957), he earned his dental degree (D.D.S.) from Western Reserve University (1957-1961) and his medical degree from the University of Miami School of Medicine (1961-1965). He then completed his internship (1965-1966) and an assistant residency in general surgery (1966-1967) at Jackson Memorial Hospital in Miami, Florida. His residency in Otolaryngology was completed at the Washington University School of Medicine (Barnes Hospital) in St. Louis (1968-1971), where he completed a Research Fellowship in 1967-1968. 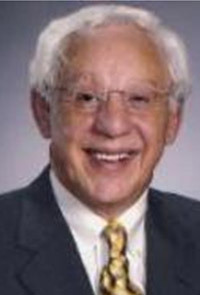 Dr. Cassisi became Chairman of the Department of Otolaryngology at the University of Florida College of Medicine in Gainesville, where he served for many years. He is currently the Kenneth W. Grader Professor and Chairman Emeritus at the University of Florida. Dr. Cassisi was inducted into the Miami Medical Alumni Hall of Fame in 2002. He remains an active participant in sports medicine and contributes to many activities at the University of Florida.